Swift Creek Animal Hospital welcomes you! 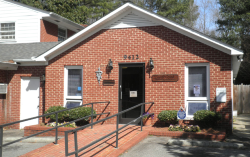 Swift Creek Animal Hospital is a full-service veterinary medical facility, located in Raleigh, NC. The professional and courteous staff at Swift Creek Animal Hospital seeks to provide the best possible medical care, surgical care and dental care for their highly-valued patients. Our veterinarians and veterinary staff strive to offer excellence in veterinary care to pets and their families in Raleigh, NC and surrounding areas. Swift Creek Animal Hospital has been serving the communities of Raleigh, Cary, Fuquay-Varina, and Apex, NC since 1986! We can't wait to make your pet a part of our family! To provide a rewarding experience for clients by satisfying the needs of their pet beyond their expectations. We will draw strength and confidence from our belief in the compassionate care of animals: that is ultimately why we are all here. The successful treatment of our patients is the result of a cooperative effort by us all. Please browse our website to learn more about our animal clinic and the veterinary services we provide for companion animals in Raleigh and the surrounding areas. Read information in our Pet Library, view videos, get to know our doctors, read veterinary information from trusted sources, and find details about upcoming events. Please call our office today at (919)851-8387 for all your pet health care needs.